Moroccan authorities announced Wednesday the arrest of six jihadists linked to the ISIS terror group. The busted cell members, aged between 22 and 42, were operating in the city of Tangier, situated in the North of the Kingdom. 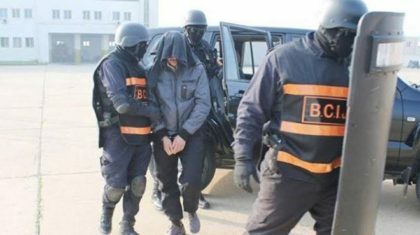 The arrest was made by the special units of the central bureau of judicial investigation (BCIJ), dubbed Morocco’s FBI, said the Moroccan Interior ministry in a press release. According to investigators, the members of this terrorist cell, led by an ex-convict in a terrorism case, are involved in assaults against several people in Tangier, using knives and metal chains. They were also planning to carry out attacks to undermine the country’s security and stability. The police found in the jihadists homes knives of various sizes, sticks, a metal chain, military trousers and electronic equipment. The arrest of this new cell is part of Morocco’s tireless war launched against terrorism. Over 50 terror cells were dismantled by the BCIJ since its creation in 2015. According to counter-terror experts, one of the main factors helping to keep Morocco’s jihadists in check is the competence of its security forces. The country’s powerful intelligence agency, national police force, paramilitary police and Central Bureau of Judicial Investigations work closely with their American and European counterparts, receive extensive training and are highly proficient. Moroccan intelligence has even helped to avert attacks elsewhere with the information it collects and shares. After the 2003 Casablanca bombings, an anti-terrorism law gave Moroccan security forces greater legal leeway to combat jihadism, and since then, authorities have been aggressive in pre-empting attacks and rounding up suspects. The Moroccan law to combat terror was strengthened in 2011, and in 2015, made it illegal for its citizens to attempt to travel to Syria or Iraq to join the Islamic State. Moroccan authorities have also developed sophisticated programs to help identify returning jihadists, monitor suspected returnees and counter the ideology of jihadism with theology. The programs have proved remarkably effective, especially when compared to the efforts of other countries in the region.